Despite having only featured once, the Sycorax remain an incredibly popular foe, one with warlike customs and the uncanny ability to use blood as a means of mental control. With no qualms about honour or morality, the Sycorax are quite simply an evil race with its members out for their own gain, this time as they attempt to get into the vault aboard a space station. This is a refreshingly straightforward approach in a time when villains are becoming increasingly complicated figures. With blood as a necessary focal point, writer James Goss takes a wise approach and avoids going down a more horror-laden route, instead opting to follow the lead of ‘The Christmas Invasion’ by keeping the blood a known entity but still jeeping it out of plain sight, focusing instead on the setting and machinations themselves. 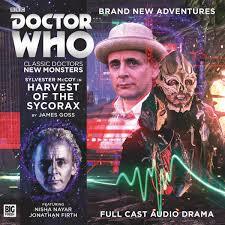 Compared to the first two stories in this set, ‘Harvest of the Sycorax’ is set in the far future, one in which the population is seemingly addicted to and controlled both by designer viruses and mood-modifying drugs. The future painted is a very bleak one, and the overall reliance on an external means of coping and living without truly living actually parallels with the Sycorax and their plan for control via a pharmaceutical company quite nicely. Unfortunately, the blunted emotions of the human population in general do come at a cost to the production as a whole, specifically during the first half or so when every situation is responded to flatly. Obviously this is the intent of the story, but it’s hard for the audience to become emotionally invested in the plight of Zanzibar Hashtag and company when there is no conveyance of any real threat or danger because of their medications. Nisha Nayar is a wonderful actress, and she does eventually get a chance to shine as a very strong and moral companion when the drugs wear off and the situation fully hits her, but the drug-induced evenness does carry on a bit too long without visuals to support the monotone voices in the audio medium. While ‘Harvest of the Sycorax’ is quite a dark story, it is presented in quite a light-hearted manner, a sensible approach to take given both the desire to control humanity by both the Sycorax and the pharmaceutical industry. Intriguingly, the Sycorax have more human-like qualities in this story than the humans themselves in their drug-induced state, and aspects such as religion and art are touched upon briefly to help flesh out the Sycorax culture more thoroughly. While the conclusion may seem quite reminiscent of ‘The Christmas Invasion’ in which a champion of the humans must fight a champion of the Sycorax, the manner in which it unfolds is wholly unique. Including the acquisition of Time Lord blood which places the Doctor under Sycorax control, ‘Harvest of the Sycorax’ ends up being an incredible second outing for the menacing and primal Sycorax, Giles Watlinng capturing the Sycorax essence perfectly in his Chief and the script revisiting vital concepts while exploring new territory with ease.